I was planning to make a chevron baby quilt for my new grandson, but then I found a new piece of fabric and decided to do something else for him. But I still want to experiment with chevron quilts, because I plan to write a no-triangles pattern for them. So I pulled out 2″ strips of solid (tone-on-tone) olive greens, tans, and rust prints and sewed them into the 80 blocks I thought I needed. Trimmed them, pressed them, started arranging them on the design wall. Ummm….. No. That was wrong. Last time I made it, I did it differently. It worked great that way. This way, not so much. I had sewn all of the blocks WRONG. And yet, I like it. 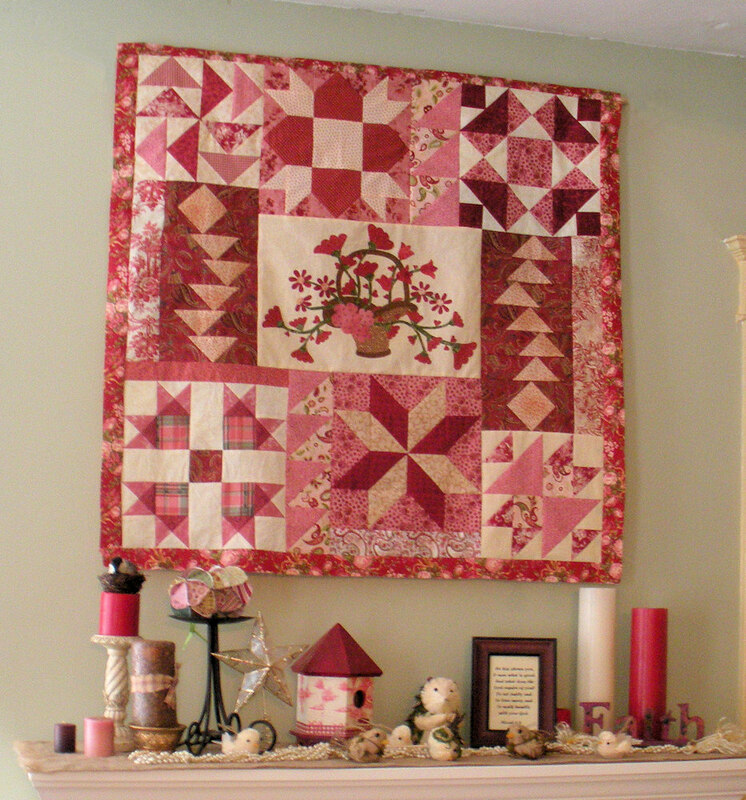 I’m partial to scrap quilts, especially for autumn themes. It’s still a chevron pattern, with a narrow tan stripe and a broad green/rust stripe. I just need to arrange the blocks effectively, to make the pattern look right. With scrap quilts, contrast is very important. Sometimes you want a low contrast, where all the fabrics mush together and make a colorwash effect. This baby quilt is all scraps, divided into two color groups but of a similar lightness. No individual pieces stand out. It is a “gentle” quilt. 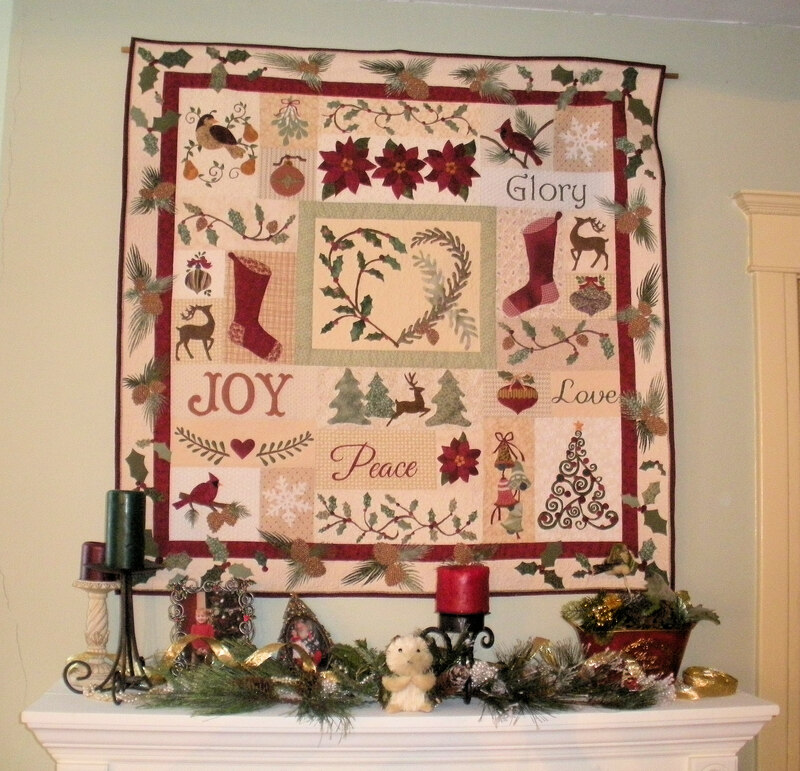 The majority of scrap quilts have backgrounds that contrast with the scrap fabrics. For the Double Wedding Ring table runner, I wanted the gray/black rings to be low-contrast scraps that read as “solid” in sharp contrast to the white background. None of the ring fabrics are too bright or too dark, and none of them have much white in them, or the finished pattern would not have be as distinct. On the other hand, I wanted the blues in this Triple Irish Chain quilt to fade out into the white fabric of the background. I had to get the right placement of dark, medium and light blue fabrics to get that effect. Without a contrasting, unifying background fabric, it’s especially important to achieve the right arrangement of scrap fabrics. Whether you are sorting by color or value, the contrast is achieved by organizing the fabrics into groups. The Americana table runner and the purple quilt are divided into light and dark groups without many “medium” scraps, to keep the pattern distinct. The Tamarack Trees quilt fabrics are divided by color and a slight, low-contrast gradation from light to dark blues from the top of the quilt to the bottom. Chevrons are considered modern patterns and are usually made in a few simple fabrics. To achieve the bold chevron pattern with scraps, the contrast between your fabrics groups – whether you are working with lights and darks or different hues – must be sharp and defined. Because this is a serendipitous quilt – I’m making the best of things after I blew it, my fabric choices are not what I would have chosen if I had been planning it this way. It required some re-organization. I had selected the greens and rusts to contrast with each other, but now I want them to appear as a “mass” of darker fabric, so they should be relatively low in contrast to each other. They will form a broad stripe, and the tans will form a narrow stripe. For this project, I am more interested in light-dark contrast than color, so I need to remove or change the color factor from the quilt. Before the advent of digital photography, I squinted through little red and green plastic filters similar to those used in photography. Sometimes I glued together a fabric crutch and made a photocopy of it, to see it in black-and-white. Looking through a peephole (purchased from the hardware store) helped me see the overall effect of the pattern, too. Later, I took pictures with my digital camera and uploaded them to the computer, where I could use Photoshop options to change the brightness and hues. Simply changing a photograph to grayscale exposes weaknesses in the fabric arrangements. And then, when I was posting a picture to Instagram the other day, I realized that it is the perfect tool for judging contrasts! Without any uploading or editing, Instagram permits me to quickly snap pictures and instantly apply a series of filters to them. You can even do it right in the fabric store, to audition fabrics before you buy them. This particular quilt was a good practice piece. I put the blocks up on the wall without any real arrangement of color. This black and white version, using the “Moon” filter, revealed that I needed to move around some of the pieces to increase the contrasts between the darks and lights, especially in the upper right quarter of the quilt and the lower left corner. It wasn’t terrible, but it didn’t have a bold enough contrast. I rearranged some of the blocks to put the darker tans near the edges of the quilt. When I applied the “Crema” filter, I could see that the zigzag pattern was more clear, but I had a group of very dark pieces in the middle that needed to be more evenly distributed over the quilt, and that lower left corner was still fuzzy. I played with it some more and kept taking snapshots until I had an arrangement I like. I can see that it is darker around the edges, but that isn’t as bad as having those dark tan pieces in the middle of the quilt where they muddled up the pattern. I like it. To further emphasize the chevron pattern, I will quilt this in two different colors – darker thread on the broad green/rust stripes and a cream thread on the tan ones. In the end, I think it will be one of my favorite quilts, and I learned a lot about the structure of the pattern. I might actually make that baby quilt in chevrons after all! Now that I have the quilt tops and backs matched up, I’ve been pin-basting them to be machine quilted. I basted 2 table runners, a baby quilt and a wall quilt before I had to stop because I was running out of pins. I had a pair of potholders, already basted, and I got those quilted! I feel so productive! If you read this post about my plethora of unfinished quilt tops, you will be impressed glad interested to hear that I matched up 21 of those tops with backings. I haven’t actually done anything with those, but it’s one step closer to having them finished! I reorganized the shelves as I described in that post. I cleared off a bookcase in the sewing room (moved the books into a bookcase in the guest room) and put the fabric on that. I also made a list of the backings I still need and put it in my purse for next time I go shopping. hmmm…. I have been to the fabric shop at least four times since I made that list and never gave it one thought. Oops. Author CathePosted on October 11, 2014 October 11, 2014 Categories WorkingTags Quilt Tops2 Comments on Reporting Progress!